Arsenal will tomorrow face French side Rennes and the club has just released the latest team news about Sokratis and Henrikh Mkhitaryan. Arsenal will this week face Rennes to conclude their UEFA Europa League round of 16 encounter with the French side and the club has just released the latest team news ahead of this game that will take place on Thursday. Arsenal lost 3-1 in the first leg of their match against Rennes so they will be hoping to overturn this. 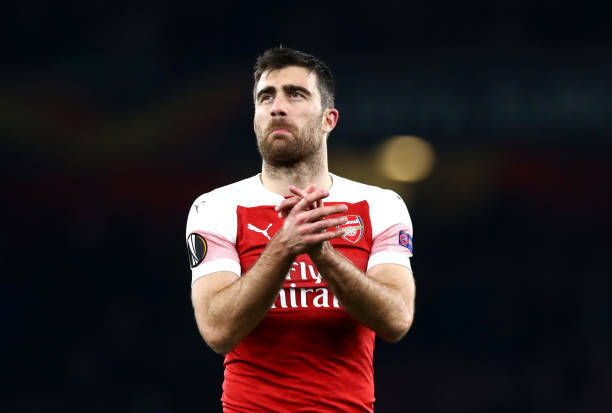 Sokratis Papastathopoulos received two yellow cards in Arsenal’s 3-1 loss to Rennes in France last week and even though Alexandre Lacazette’s red card was reduced to only two matches, the gunners will still be without the Greek defender because he will still serve his sentence. If Arsenal defeats Rennes and progresses to the UEFA Europa League quarter finals, Sokratis will be available for those matches because he did not receive a direct red card as Alexandre Lacazette. Henrikh Mkhitaryan was not in the 18 man squad that faced Manchester United on Sunday because he had a mild back strain. The latest team news from the club say that the Armenian international will be assessed ahead of this match before he can be cleared to take part in this match. Arsenal head coach Unai Emery will be disappointed if Henrikh Mkhitaryan does not get cleared to play because he will be helpful in defeating Rennes because he has been on form in the last few weeks. Henrikh Mkhitaryan was voted as Arsenal’s player of the month for February. The team news from Arsenal also confirmed that Hector Bellerin, Danny Welbeck and Rob Holding are still recovering from their injuries.